DIY smear tests should be introduced as soon as possible to reduce cases of cervical cancer, a charity has said. Jo’s Cervical Cancer Trust made the plea in a bid to diagnose the disease at an earlier stage. The latest NHS figures show only 71 per cent of women are up to date on screening – the lowest rate since records began – and around five million women are overdue. Reality TV star Jade Goody died of cervical cancer aged just 27 in 2009 and the charity’s campaign comes on the 10th anniversary of her death. 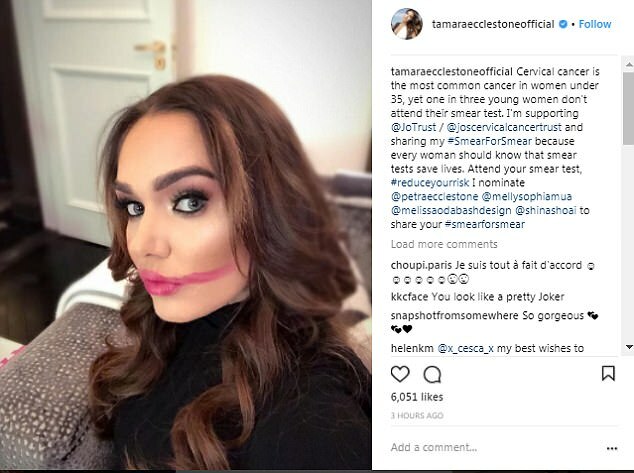 Celebrities including Rebekah Vardy and Tamara Ecclestone have used social media to urge women to get tested, but screening rates have still not risen. Robert Music, chief executive of Jo’s Cervical Cancer Trust, said self-testing could not come soon enough. He said Australia and Denmark, which already use home testing, are seeing ‘fantastic results’ in prevention and the number of early diagnoses. He added that it could be a ‘game changer’ for those with physical or psychological difficulties with the usual test, which is carried out by a medical professional. The scheme – in which HPV testing kits are sent in the post then returned to the NHS – will be trialled in England with a view to national implementation. 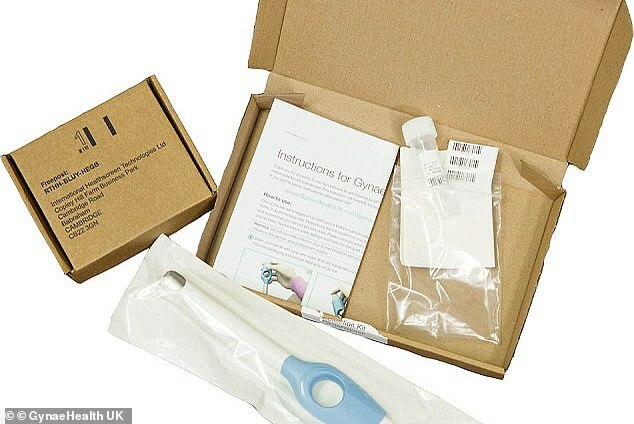 By December 2019, authorities plan to make a postal DIY smear test, that also checks for HPV, available to all women across the country. Officials hope it will boost screening coverage by reaching women who have ignored invitations for tests because of embarrassment or difficulties getting an appointment. The pilot scheme was announced as NHS England revealed that cervical screening administration will return ‘in-house’ from June after it terminates the contract with the scandal-hit company currently doing it, Capita. The decision follows a series of screening blunders, including Capita’s failure to send invitations or test results to 50,000 patients last year. Jade Goody, a reality TV star who shot to fame after appearing on Big Brother, died of cervical cancer aged 27 in 2009. Goody was diagnosed with cervical cancer on television while she was featuring on Bigg Boss, the Indian version of Big Brother, in August 2008. By February 2009, Goody’s cancer had spread to her liver, bowel and groin so she had emergency surgery to remove three tumours. The same month, Goody was told she had just months to live so she and her partner, Jack Tweedy married on March 12 – she died on March 22. Later in the year, cervical screening rates rose sharply in the UK in what was dubbed the ‘Jade Goody effect’. She had brought such a high profile to the disease the number of women screened in 2008/9 was 3.6million, up from 3.2m the previous year, The Guardian reported. Although screening rates have since dropped again, Goody’s mother, Jackiey Budden, continues to use her daughter’s legacy to encourage women to get tested. Professor Sir Mike Richards, who is leading a review of NHS cancer screening programmes, told MPs the DIY tests will follow a scheme tried in the Netherlands, where postal kits boosted uptake. Studies have found the tests are nearly as accurate as those done in a clinic. And women who missed screening appointments were twice as likely to provide a sample for testing as they were to respond to reminders to come to a clinic, Belgian research found. Around 3,200 British women are diagnosed with cervical cancer every year and 1,000 die with the disease annually. But these rates are projected to rise by nearly 40 per cent in the next 20 years.